Features in a Martian meteorite believed by some to be the fossilised remains of alien bacteria may have formed underwater, scientists claim. Researchers have found a "striking" match between microscopic features on underwater rocks and mineral deposits from Earth and microbe-like structures in the famous Martian meteorite ALH84001. The discovery could bring scientists closer to knowing whether the 3.9 billion-year-old meteorite contains fossilised alien life. The evidence comes from volcanic rocks and underwater geological formations called calcareous pinnacles found below the surface of Lake Van in Turkey, the world's biggest alkaline lake. These rocks and pinnacles are dotted with globules of complex carbonates, very similar to those found in ALH84001. They are also home to colonies of photosynthetic cyanobacteria. When examined under a scanning electron microscope, carbonates from Lake Van were seen to be made up of tiny rod-like and ovoid structures - referred to as "nano-bodies" by the researchers - of a similar size and texture to those famously described in ALH84001. The research was carried out by Professor Jozef Kazmierczak of the Polish Academy of Sciences and Professor Stephan Kempe of the Technische Universität Darmstadt, Germany. Professor Kazmierczak said the Lake Van samples were the best match for the structures in ALH84001. "Physically and chemically, there is a strong indication that we are looking at something similar," he told BBC News Online. In the journal Naturwissenschaften, the authors argue that the globules in ALH84001 may have formed in an alkaline lake on Mars. The findings support a growing body of evidence that lakes and shallow seas were once commonplace on Mars. They propose several possible origins for the Lake Van carbonates. One possibility, say the scientists, is that they formed during the decomposition of cyanobacteria by heterotrophs - bacteria that derive their energy from organic compounds. 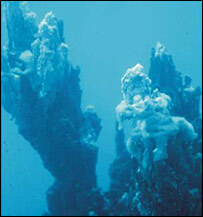 But the researchers also suggest the carbonates could have formed spontaneously through precipitation. 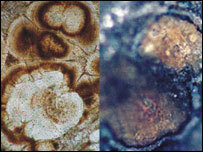 If this were shown to be true, it would cast doubt on theories that ALH84001 contains remnants of Martian life. Kazmierczak and Kempe draw no conclusions about the nature of the nano-bodies. But other researchers have made claims for the existence of ultra-small microbes called "nannobacteria". 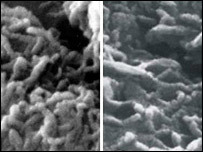 The existence of nannobacteria is fiercely disputed by many scientists, who believe in a lower size limit for life. One recurrent criticism against the Martian life theory is that nano-bodies in ALH84001 are simply too small to be fossilised life forms. Professor Hojatollah Vali, a planetary scientist from McGill University in Montreal, Canada, who has worked on ALH84001, said there was no evidence for the existence of nannobacteria. Instead, he favours a non-biological origin for the Lake Van carbonates. 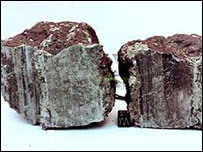 Professor Vali said the presence of magnetite and iron sulphide in ALH84001 similar to that produced by certain bacteria on Earth was the best sign life once existed on Mars. But Dr Kathie Thomas-Keprta of Lockheed-Martin Corporation in Houston, Texas, who has also worked extensively on ALH84001, was intrigued by the Lake Van samples. "The similarity between the Lake Van and ALH84001 carbonates is striking, in that the terrestrial carbonates are of varying composition and appear chemically complex," she told BBC News Online. The controversy may only be solved once space missions return to Earth with rocks from the Red Planet.